Follow the history of football in Llanrwst. Welsh Cup results, League placings, and development from Llanrwst Town, through Gwydyr Rovers, and on to Llanrwst United FC. Llanrwst won the toss, and pressed for the first five minutes, but, unfortunately, they could not score. From a corner, Elias scored first point for Llanrwst. The visitors then scored, which was disallowed as a player was off-side. Llanrwst right wing had a run, and Eames scored off Elias's shot. Half-time: Llanrwst, 2; Colwiyn Bay, nil. Two minutes from the restart, J. R. scored a third point for Llanrwst. LLANRWST TOWN v. CARNARVON IRONOPOLIS. Played at Llanrwst. Llanrwst won the toss. From a corner, Carnarvon scored, and from a shot off, Evan James equalised for Llanrwst. The visitors pressed, and made a good attempt to score, but Hayes saved nicely. James again scored for Llanrwst. The home left wing played a neat combined game, but the visitors' backs defended well. In the second half, the Llanrwst team had much the best of the game, adding four goals, and when the whistle sounded, the score stood Llanrwst, 6; Carnarvon Ironopolis, 1. CONWAY BOYS' SCHOOL v. LLANRWST ALBION. The fame of the "Conway Boys" having gone widely abroad, there was quite a crowd on the Morfa on Saturday to witness the above match, but the hitherto unbeaten School suffered defeat. The result of the match, which was 12 goals to nil in favour of the Albions, was no surprise to anyone, for the disparity in the age and weight of the two teams was too great. The Llanrwst Eleven being none other than a Junior team, and the general opinion was that the game ought never to have been played. The "Boys" though against heavy odds played pluckily to the end, and but for their splendid defence, and the general high standard of their play, the score would doubtless have been much heavier. As it stands, how ever, they are worthy of all the praise, and ought be proud of the fact, that they have won easily all their previous matches, their goal average forming quite a record. Llanrwst Albions: R. Chambers; E. Owen and S. Hughes; H. P. Jones, E. II. Jones and Walter Owen; R. Davies, H. James, Idwal Davies, H. Jones and R. Roberts. Conway Boys' School: J. E. Jones; E. Hughes and Wm. J. Ellis; R. T. Williams, E. E. Roberts and W. LL Jones; Thomas Pritchard, Lewis L. Jones, Wm L. Parry, H. Jones, and J. Parry. On Saturday week the "boys" propose to play, the return match with the Conway Swifts. The above met on Saturday at Llanrwst. In the first half the game was very even, Idwal Davies scoring the first goal for the Albions. In the second half, the Albions had the best of matters and scored twice through Ivey Gerard and Idwal Davies. The game thus ending in a Win for the Albions by 3 goals to nil. This it, the fourth time these teams have met, and on all occasions the Albions have been victorious. Goal, Robert Roberts; backs, W. T. Jones and Oswell Owens, Halves Bert Evans, Stephen Hughes, and Evan Hugh Jones; forwards, David Isaac Morris, Idwal Davies, Ivey Gerard, Howell Jones, and Howell James. Referee: Mr R. D. Richards. I am currently ploughing around trying to find out as much as I can about my paternal grandfather - John French Pierce,born 7 August 1915 and died November 1991. Any information that could assist in finding more about John would be very well received. John's parents were Thomas Pierce and Mary nee Davies. His father Twm Pyrs as they called him locally (Thomas Pierce) came originally from Dinbych (Denbigh) in North Wales and was a plasterer who served in the Somme as a private in the Royal Welch Fusuliers during the first World War. John was born on the 7th August 1915.John's birth certificate has the family address as 4 Wellington Street Llanrwst. John was named after a General French who was famous at the beginning of the 20th century. The family were Welsh speaking and lived in a house called The Plough in an area called Scotland Street in Llanrwst, since demolished. The house was double fronted and had a piano. Wil one of his bothers played the piano and John French enjoyed singing. He played for Llanrwst Town for a couple of years including the Vale of Conway League Championship for 1936/37 and the Jack Owen Cup - per the medal below. For a period of time he was a professional footballer playing for the Belfast Celtic team in Northern Ireland. (click here for the history of the club). John joined the Royal Welch Fusiliers with his cousin Robert Davies and landed in France just after the D-Day landings. During the Second World War, he served in India and then in Burma where he may have contracted a tropical disease. When he came back to Llanrwst his skin was yellow and he spent some time convalescing in The Waterloo Hotel in Betws y Coed which was converted into a hospital during the war. Robert 's parents were Robert senior and Mary Davies. Bob Bach (little Bob), Robert Davies died in the 1970s. John was terribly wounded around the same time - haven't found the exact date yet. John was confined to a wheel chair and spent a long time in Stoke Mandeville hospital. He would have been around 32 when the first Stoke Mandeville Games took place so, with John being a sportsman, I am also looking at whether he was involved in these as well. I have been trying to get the Stoke-Mandeville connection as JFP was supposedly very active sportsman (Rugby union supposedly) and was in this hospital around the time Guttman started the games. Their first season in The Welsh League Division One. Above; Llanrwst United's historic stand which they obtained from Accrington Stanley's Peel Park ground, when they resigned from the Football League during the 1961/62 season. My thanks to Phil Smith, Chairman Llanrwst United FC for this information. 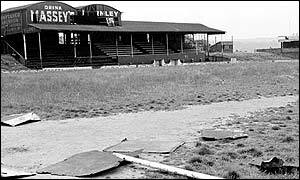 When Accrington Stanley reformed in 1968, they moved to the Crown Ground. I don't think they asked for their stand back!! Accrington's kit in 1962 is pictured here. Accrington Stanley v Colchester United 13th January 1962. Stand at Accrington's Peel Park in 1962.